7th May, Lake Wales: WBW World Bowler of the Year and local favourite, Diandra Asbaty was crowned World Raking Masters 2007 champion with a convincing victory over Zara Glover of England while Englishmen, Stuart Williams took the Men's title. Diandra, who opted to start the finals against challenger, Zara Glover of England on short oil, crusied to an easy 233-148 victory in the first match. Glover, who ran into tons of problems with splits in the first, fourth and ninth frames, was compounded with a miss in the sixth and 10th frames too. In the second match, Diandra brought home a yet another clean game with a double in the third and fourth frames and four-in-a-row from frames sixth onwards for another impressive 235. The Englishwomen started off well with a double but another split in the third proved costly despite coming back strongly with four-in-a-row thereafter. 183,201 for a 2-0 win while the champion had to work hard stretching to 3 matches to earn her final spot after knocking out Alicia Marcano of Venezuela, 2-1. The women's quarterfinals started off with a surprise victory from Marcano when she edged top-seed, Caroline Lagrange of Canada, 2-1. Diandra was equally impressive taking out Patricia Schwarz of Germany, 2-0 in the second semi. Two Malaysians, Wendy Chai and Zandra Aziela failed to progress when Chai lost to Aumi Geurro, 1-2 despite narrowly loosing to Guerro, 221-226 in the third deciding game while Zandra lost to Glover, 0-2 in the fourth quarterfinal match. Diandra won US$10,00 as the newly-crowned champion with Glover settling for US$5,000. The loosing semifinalists took home US$3,000 each while positions fifth to ninth won US$1,000 each and the 10th-placed, Putty Armein won US$500. The finals between Stuart Williams of England and Peter Ljung of Sweden was the closest-ever match on TV and certainly a match of the century. A costly single-pin miss by the Englishmen in the fifth frame of the first match allowed the Swede to take the match, 236-233 for a 1-0 lead to Ljung. WIlliams came back with a vengence in the second to draw level at 1-1 edging his opponent, 235-224 this time it was the Swede that had an open frame in the fourth. And when Ljung had a split in the second frame of the deciding match, Williams knocked down five strikes-in-a-row and another five-in-a-row from frame eighth to cruise to an easy victory. Despite a turkey after the second-frame split, another split in the sixth frame proved disasterous but the Swede still gave his best by bringing in six strikes-in-a-row to go down 240-269. Stuart had to work harder to reach the finals earlier after being stretched to 3 games by Austria's Thomas Gross in the first semifinal match. Stuart's 186, 197 and 206 was enough to win 2-1 to the Austrian's 234, 151 and 204. Stuart also knocked out Davis O'Sullivan of USA 2-0 in the quarterfinals. Peter Ljung cruised to a 2-0 victory over two-handed Jason Belmonte of Australia in the quarterfinals before taking eliminating England's Paul Moor, 2-0 in the semifinals to set up the showdown with Stuart. 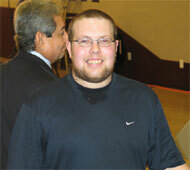 Stuart bagged US$10,00 as the newly-crowned champion with Peter settling for US$5,000. The loosing semifinalists took home US$3,000 each while positions fifth to ninth won US$1,000 each and the 10th-placed, Mark Buffa of Canada won US$500. Photos courtesy of Herbert Bickel, Bowling Digital. 6th May, Lake Wales: Both Squad 2 leaders, Osku Palermaa of Finland and Diandra Asbaty of USA ended the final squad of the World Ranking Masters 2007 to bag the US$1,000 bonus for the second time and led the top 8 into the quarterfinals. A 276 from Osku Palermaa in the second game on dual lane condition allowed the Finn to stretch his lead from 40 pins overnight to 131 pins over Stuart Williams of England in the overall standings. And another 277 gave Osku 777 three-game series with Williams loosing ground to the vibrant Finn. With 236 in the fourth game, Jason Belmonte of Australia came up to second on this squad with 255. The leader became the first bowler to break into four figures, compiling 1013 over his first four games. It was becoming a dogfight for the lower of the eight places and teeth were grinding throughout the center. Peter Ljung's 287 in the fifth game made up a lot of grounds on Osku for the Swede and if he could maintain a good average, he would certainly be in the top 8. Most of the games from the top half of the table were over 200 by then. Despite a 196 in the final game from Osku, a 267 earlier in the seventh was good enough to confirm the US$1,000 bonus plus another US$1,000 topping the field in pole after the three squads on a total of 5798. 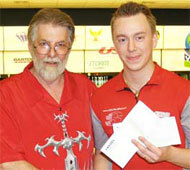 Two-handed bowlers made it a one-two with Belmonte in second with 5564 and Staurt Williams third with 5523. Squad 1 joint-leader, Paul Moor finished fourth ahead Martin Larsen of Sweden in fifth, David O'Sullivan of USA sixth, Peter Ljung of Sweden seventh and the final spot going to Thomas Gross of Austria. Perhaps the unlucky ones were Squad 1 winner, Remy Ong of Singapore in ninth, just 29 pins adrift. Asian men disappointed with Biboy Rivera 12th, Zulmazran Zulkifli 13th, Alex Liew 15th, Ryan Lalisang 16th, Wu Siu Hong 17th, Yannaphon Larpapharat 20th and Azidi Ameran 23rd and were all eliminated. 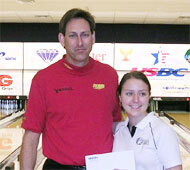 Meanwhile, WBW Bowler of the Year and Squad 2 leader, Diandra Asbaty of USA won her second US$1,000 bonus after a convincing lead in squad 3. It appeared that the girls had adapted to the dual lanes conditions much better than their male counterparts. A 279 by the Diandra allowed the American to move up to second and demoting Zara Glover of England into third as Patricia Schwarz of Germany made steady progress up the table and just 6 pins short of the cut line. The field average increases slightly when Diandra and Malaysia's Zandra Aziela posted 249 and 248 in the third game with Indonesia's Putty Armein loosing her eighth place with Wendy Chai taking over the final cut off spot. At the halfway mark, the German took fifth spot with Wendy in sixth while Diandra gaining ground on Caroline Lagrange for the enviable first place. With Wendy, Schwarz and Glover scrambling over fourth to sixth spots, Diandra close the gape to only 55 pins after game 6. The fight between Caroline and Diandra became more intense as just 21 pins separated the two with the eighth and final game to play. Despite only posting 1755 in her third squad, it was sufficient for the Canadian to claim the overall pole and the US$1,000 bonus on 5499 total. 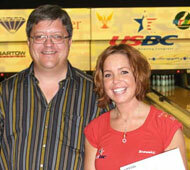 Diandra settled for second with 5446 but won her second US$1,000 by topping squad 3. A superb 1018 in the second half saw Zandra Aziela storming into second on this squad but more crucially making the top 8 cut in seventh with 5205. Fellow countrywomen, Wendy Chai took third spot overall with 5257 ahead of Zara Glover in fourth with 5249 and Patricia Schwarz fifth with 5228. Venezuela's Alicia Marcano and Sweden's Helen Johnsson made the cut in sixth and eighth respectively. Last year's runner-up, Putty Armein missed out in 10th with the youngest competitor this year, Tannya Roumimper in 12th. The biggest disappointment was seeing defending champion, Sara Vargas of Colombia and Shalin Zulkifli of Malaysia out of the top 8. The top eight will advance to the best-of-three game rounds this afternoon, taking to the lanes after the top eight men fight their quarterfinal. Both semifinals will be completed later this evening and the televised fnals will take place Monday afternoon. Story by Keith Hale, Bowler's Journal International, photos courtesy of Herbert Bickel, Bowling Digital and B.C. Cheah, MTBC. 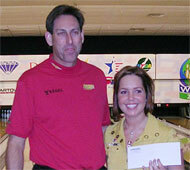 5th May, Lake Wales: The WBW Bowler of the Year, Diandra Asbaty stormed into third spot overall and bagged the the ladies' Squad 2 prize of the World Ranking Masters 2007 while Canadian Caroline Lagrange continued to top the division. A nice surprise for the French fans as Isabelle Saldjian set a fast pace at the start of the ladies' second squad being pursued by Alicia Marcano of Venezuela and Colombia's Sara Vargas but Canada's star, Caroline Lagrange refusing to budge from pole position. At the end of the halfway-mark, local crowd favourite Diandra Asbaty of USA made an amazing transition rising from 25th place after the opening games of first squad into the top 8 bracket. The youngest female player, Tannya Roumimper of Indonesia made an great comeback after an embarrassing 129 with 268 and was doing better than last year's runner-up and fellow countrywomen, Putty Armein but still behind her. 8. The American continued her steady pace to lead the field after the sixth game while Lagrange recovered from a lowly 175 in game 5 with a 258 and was 100 pins clear of second-placed Zara Glover in the overall standings. A good 258 in the seventh game by Asbaty put her firmly in front of this squad and had steadily moved herself up to fourth overall. A superb 268 in her final game confirmed the squad prize of US$1,000 with 1885 despite Lagrange hitting a 267 for 1859. The Canadian had built up a healty lead of 100 pins with 2744 over Glover on 3544 with Asbaty finishing third overall just 22 pins adrift the Englishwomen on 3522. The other five places being occupied by Aumi Guerra of Dominican Republic, Alicai Marcano, Helen Johnsson, Putty Armein and Tannya Roumimper from fourth to eighth. "I definitely think I matched up well today and made good bowling ball decsions," Diandra remarked. "I just felt good all day." Story by Keith Hale, Bowler's Journal International, photos courtesy of Herbert Bickel, Bowling Digital. 5th May, Lake Wales: Reigning World Cup champion, Osku Palarmaa of Finland took over pole position of the men's overall standings in the World Ranking Masters 2007 and the squad prize of US$1,000 in the process. A superb 246 from the joint first squad leader, Remy Ong allowed the Singaporean to take a brief lead at the expenses of Paul Moor shooting a poor 170 opener in squad 2. Ryan Lalisang stole the limelight as a stubborn 10-pin robbed the Indonesian of a perfect game on 299 in Game 2. By the third game, the 2006 WBW World Bowler of the Year and World Cup champion, Osku Palermaa of Finland had taken over the lead in both this squad and overall standings but just 1 pin ahead of Lalisang. Wu Siu Hong of Hong Kong, who really suffered on the long oil condition yesterday was much happier on the short oil and was third at this stage. Despite grabbing the lead at the halfway mark of this squad, Wu was still way down the overall table. While the two were going at it, hammer and tongs to get back the lead, the short oil condition was proving to difficult to master as Paul Moor struggled and dropping to 24th on this squad and seventh overall. The elusive perfect game had yet to come and once again a 7-pin stood in its way for Stuart Williams in game 6 but had allowed the Englishmen to take the lead and an eye on the US$1,000 bonus with Wu close on his tail. A 278 in game seven put him in a comfortable position with 62 pins lead and a 25 pins buffer over Osku Palermaa in the overall standings. For the second night on the trot, highway robbery was committed against an English bowler. Last night, Remy Ong had the audacity to tie with Paul Moor and snatched the bonus and today Stuart Williams had a 62 pins advantage going into the last game but was pipped at the post by just 3 pins when Palermaa rolled the tournament's first 300 game. The pair are also one-two in the overall standings with 3852 and 3812 respectively ahead of another two-handed player, Jason Belmonte of Australia third with 3758. "Stuart had some bad breaks and I had some good ones," commented Osku after the squad. "But that's bowling." Looking forward to tomorrow's baffling dual lane condition, with one lane on short oil, the other on long, Osku said: "I'm quite happy with that set-up. I bowled on it last year in the World Ranking Masters in Kuwait and I think I hit over 1900 over the eight games." 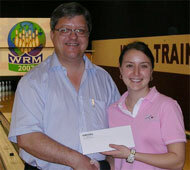 4th May, Lake Wales: Caroline Lagrange of Canada, topped the ladies' first block of 8 games of the World Ranking Masters 2007 and bagged the US$1,000 squad prize Friday morning. Diandra Asbaty was quite a favorite with the crowd after coming off a disappointing runner-up finish in the USBC Queens in Charlotte, North Carolina and then had to rush down here to Florida. Sara Vargas from Colombia, had the advantage of working here at the Kegel Training Center so was right up to date with the lanes. A 278 opener from England's Zara Glover made her intentions known to this field with just one leftie - no two-handers and no spinners! The big shockwave was seeing Diandra Asbaty of USA down in 25th place but it won't be long before she will be back in contention. In game 2, the guns they were a'blazing at the Kegel Corrall this morning. A 279 from Canada's Caroline Lagrange brought her up into second place but Glover still had four pins advantage. A 241 from Asbaty also brought her up from 25th to 18th and only one bowler, Paola Gomez from Colombia having yet to hit a 200 game. By Game 3, a very handy 735 over the first three games kept England's Zara Glover in first place as she increased her lead to 28 pins over Canuck Caroline Lagrange. The Canadian's 279 was still the highest game of the day and Gomez was still lacking a 200 game. Glover was still there at the top by game 4, withstanding and repelling all challengers. A 258 this time brings her 49 pins above the constant challenge of Caroline whilst the rest in the top eight chop and change. Five from the American zone, one from Asia and two from Europe in the prestigious top eight. Pass the halfway mark, it was hard to believe that Glover could dominate the leaderboard for so long and it was a case of fingers crossed that she didn't suffer the fate of fellow countryman Paul Moor in the men's division last night. Diandra Asbaty was slowly climbing back up the leaderboard and looked a little happier than she did first thing this morning. Another 278, this time from German Patricia Schwarz, now a resident of Finland, brought her up into fourth place. Game 6 and things were getting a little bit tighter. The gap between the frontrunners had dropped to 19 pins, so the next game will be vital for both players. Steady bowling by Aumi Guerra from the Dominican Republic brought her into contention, maybe from the wise coaching of Craig Woodhouse, the WBW Outstanding International Coach of 2007. There were a lot more sub-200 games creeping into the equation as the girls felt the pressure and also the fatigue. They had been out there on the lanes for over four hours, now and there were still two games to go. Well, we thought it was coming and we were proved right. Caroline Lagrange stuck to her guns and a 202 shot her into pole position as Glover hit a lowly 177 after a 185 to surrender the lead. Now the one to watch was Guerra as her bowling was so consistent and a high final game could promote her into first place to bag that $1,000 squad prize. And what a great final game this was - strings of strikes right across the house and Caroline Lagrange of Canada putting on a great spurt in the home straight with a 289 and a nice fat bundle of $1,000 for leading the squad. Zara Glover fought back hard with a 269, but it was nowhere near enough to bridge the gap. One of the last players to finish was Choy Poh Lai of Malaysia and she was on a string of ten strikes and looked really good for the tournament's first perfect game. Unfortunately, a stubborn four-pin stopped that happening but she matched the 289 of Lagrange. Perhaps surprisingly, there were just two Europeans in the current top octet. They face three from the Asian zone and three from the Americas. Caroline Lagrange, a graduate of Wichita State University, which has one of the most comprehensive collegiate bowling programs, may be well known in Europe for her silver medal finish in the World Youth Championships in Berlin. "The pin carry here is just great," she commented after the squad. "This is a huge event and it is wonderful to be playing alongside the best bowlers in the world. I'm just loving every minute here." Story by Keith Hale, Bowlers' Journal International, photos courtesy of B.C. Cheah, MTBC. 3rd May, Lake Wales: Three lefties finished in the top 8 in the first block of 8 games as Remy Ong of Singapore and Paul Moor of England shared the lead of the World Ranking Masters 2007 underway at Kegel Training Centre Thursday evening. An expected onslaught on the pins from two-handed delivery Osku Palermaa of Finland, has yet to appear but the other with that style, Jason Belmonte of Australia, is on the right road with a 253. After the second gmae, two lefties surged to the top of the table, followed by the two-handed Jason Belmonte. Not a spinner n the field this year. It's a long time, if ever, since an 817 was posted as the score after three games of the first squad, especially as this eight-gamer is on long oil, but that is the happy situation for Paul Moor, England's top ranked player and rankings leader for three years on the European Bowling Tour. Moor was certainly on a mission this evening. 1085 over four games was no mean score and he was over one hundred pins clear of his nearest challenger, Osku Palermaa of Finland. All three lefties and the two two-handed stars were all in the top eight. Game 5 had seen somewhat of a change around but there were still two left-handers and the two two-handed guys in the top eight. A disappointing drop for Alex Liew of Malaysia to 18th but David O'Sullivan was pleased to get up into the top echelon. Moor continued his relentless march to victory, still with a 70-plus pin lead over Palermaa. Belmonte dropped out of the top eight, but only four pins adrift. After a drop to 214 the overall game average made a comeback, it must be the bowlers getting a second wind. A 279 from singapore's Remy Ong brought the battle for the top spot and the $1,000 squad prize a lot closer. Just 16 pins buffer for Paul Moor and Osku Palermaa was really not out of the hunt. The unfortunate situation of a tie for total pinfall of 1969, a 246 average, over the eight games for Paul Moor and Remy Ong robbed the Englishman of a share of the $1,000 squad prize as the tournament rule states that in case of a tie the prize would be awarded to the person shooting the highest last game, so the money went to the Singaporean. This came really hard for Moor as he had led the squad with some superb bowling and one pin has cost him a lot of money. "I lost quite a few pins with a bad game on lanes 5 and 6 and when I got to lanes 7 and 8 the ball kept falling off my hand," explained Moor. "At the beginning of the squad I couldn't do anything wrong. It didn't seem to matter where I hit the headpin as I got a strike. Now it is disappointing not to get some reward for all that effort. Remy Ong walked away with one thousand unexpected dollars. "I didn't really realize what was going on," he explained. "I was totally focused on my own game and just bowled. You can't control what is going on elsewhere so I play one shot at a time. I'm really pleased that it all worked out well."